Where the boys are . . . Bourbon Street. Compared to present day Gay Pride parades, this is rather quaint and restrained. 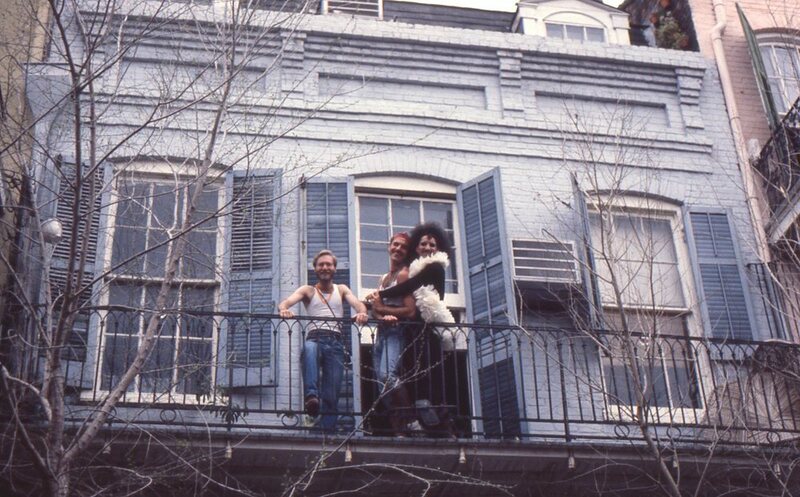 In 1981, just 19 years old, my old Canon AE-1 and I went down to New Orleans for Mardi Gras. At the time, I had a friend named Angie Radford, with whom I had studied in the USSR, who was a student at Tulane University. We rented costumes - hers a French maid and mine a dance hall girl - and went to Mardi Gras. These pictures are some 35 years old now and seem tame compared to what goes on now. These were innocent times. Angela Radford - if you know where she is, tell her to come to my blog. Krewe of Endymion, I believe. If not them, Bacchus. It is interesting to look at these costumes and wonder who would criticize them today for being politically incorrect? But, it was Zulu's choice. Look on the far right - "Here, have a beer." Begging for beads. "Throw me something, Mister!" We did bring bottles of liquor to the Zulu parade to try to barter them for a coveted coconut, but alas . . .
Not that the alcohol went to waste, mind you. Again, could be Endymion, could be Bacchus, could be something else. Thirty-five years is a long time. need to find the time to restore these photos. They are scans from slide film.